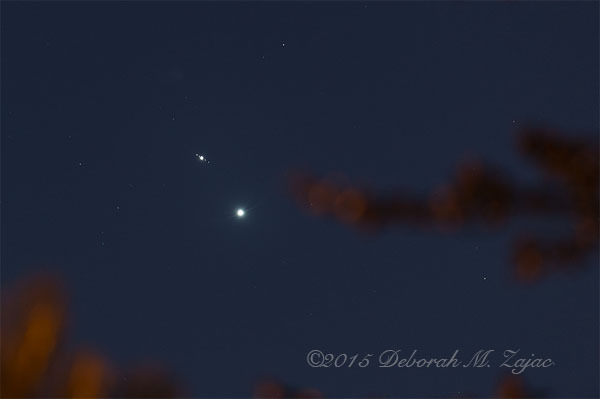 Venus and Jupiter are pretty close together tonight: just 1.1º. Also visible with binoculars or a Telephoto lens are Jupiter’s Moons. Europa, Io, Ganymede, and Callisto. Jupiter are its Moons. Tomorrow they’re be even closer together, just 0.6º apart! If I’m lucky I’ll find a spot other than my yard without tree branches in the frame. 🙂 The best time to see this is after Dusk looking West. 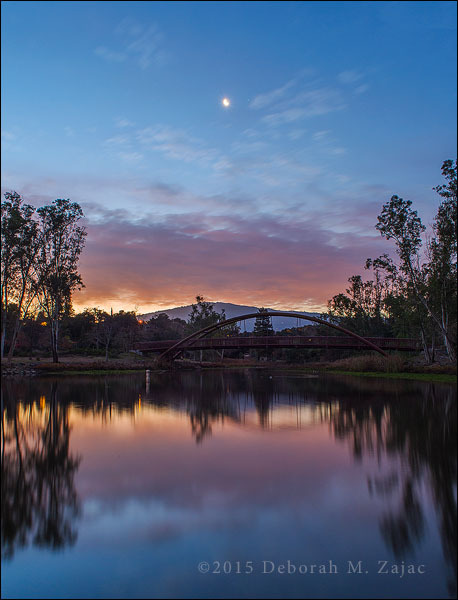 I usually check out the sky first thing when I wake up so, this morning when I raised my blinds and saw the Moon with Saturn shining in the cloudy sky I realized they would be lining up high over the lake, and footbridge. So, I got dressed, grabbed a quick cup of tea, and slice of toast and headed to the lake. It was still dark when I arrived. The Geese weren’t even up yet! I kept my eye on the sky and clouds. It didn’t look too good when I got down to the lake. The Moon was completely blocked by the clouds, but I hoped for pockets, and breaks and just after dawn the clouds cleared enough. I used a wide angle lens to be able to capture this whole scene so the Moon, Saturn that little white dot to the right of the Moon, and the fainter Antares below the Moon to the right are really teenie. I was thrilled there was color this morning too. This is a single frame processed in Photoshop CS6.